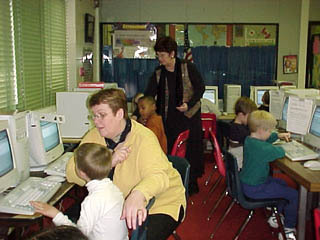 March 28, 2001 - Today Mrs. White's afternoon kindergarten class visited the "Write Place" computer lab for the very first time. They learned about the space bar, the Backspace key and the Enter key. They even learned how to make uppercase letters with the shift key! They are learning the letter Q and the number 14. They used PAINT in Windows 98 to make a drawing of 14 objects. We took their pictures and made a digital quilt. Our visitors from Iceland, Hilda and Eygló, helped the students as they worked in the lab. We are proud of our kindergarten students! Each student typed the same text on the computer. Here are two samples.